The Terasaki Research Institute is filled with optimistic scientists and clinicians who are working to solve the biggest problems related to organ transplantation. Eide Industries was honored to help the Institute as they built a new facility that payed homage to the inspiration and legacy of Dr. Terasaki, the Institute’s founder. 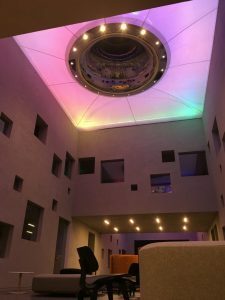 We manufactured and installed two PTFE membrane skylights for the lounge areas – adding natural and colorful lighting to the areas where researchers could decompress between their focused inquiry sessions. Among all the unique features of the new building, the PTFE membrane skylights were designed as tensegrity tensioned membrane structures. The mirrored oculi window and programmable lights served as a remarkable centerpiece to the lounge area. During the day, the PTFE membrane skylights offer a soft, warm light that supports the project vision for creating a relaxing atmosphere. However, the space also needed to be dynamic – illustrating the Institute’s innovative nature during the entertainment and fundraising events that would also take place in the space. 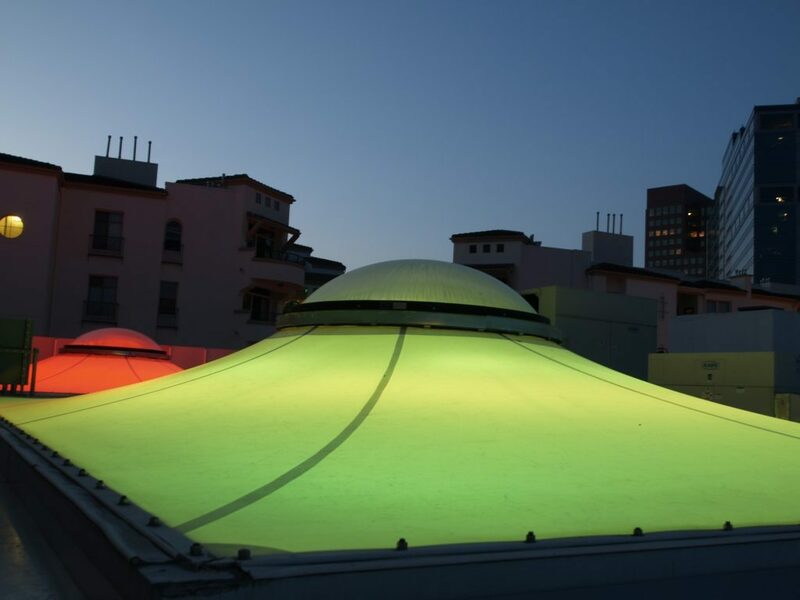 The design for a series of RGB programmable lights took advantage of the lower membrane’s 29% light transmission to create a magnificent display in the evening hours. The colorful light system evenly disperses throughout the entire membrane, giving the whole room a bold transformation. Manufacturer: Tension Structures, a division of Eide Industries, Inc. 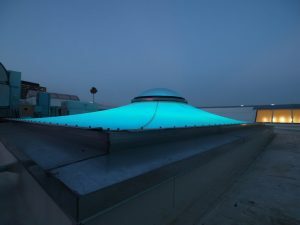 Contractor: Taslimi Construction Company, Inc.
Architects of Record: House & Robertson Architects, Inc.
Are PTFE Membrane Skylights Right for Your Next Project?